This Redken Scalp Relief Soothing Balance Shampoo is designed to relieve and calm sensitive or irritated scalps. Once applied, it will delicately cleanse and rehydrate, whilst also removing impurities from the scalp and hair. With the help of soothing eucalyptus and cooling liquorice to support the relief of scalp tension and pressure, Scalp Relief Soothing Balance Shampoo guarantees to leave your hair and scalp feeling revitalised and in perfect health. 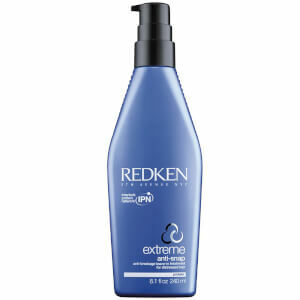 It contains the exclusive Redken Calming Suspension properties. Excellent product. I bought this to relieve a very irritated scalp (psoriasis) and already can feel the difference after just 3 washes. This product is excellent, I have an extremely sensitive scalp and this really soothes it. It is very good value for money as not much shampoo is required in order to get a good lather. Was having a very severe case of sensitive scalp (red, flaky and itchy ewww) until I bought this and it completely turned my scalp condition around with about 5 uses. I also have fine and limp hair but thankfully this doesn't weigh my hair down more! Loving this!!! Girls with sensitive scalp should buy this! Really good Redken Scalp Relief Soothing Balance Shampoo if you have itchy, flaky scalp. Flakes stopped first time I used it, great! Highly recommend. I suffer from a very sensitive scalp and this Redken Scalp Relief Soothing Balance Shampoo helps greatly. It has a lovely refreshing scent and I do think it helps keep my scalp calmed and flake-free. I really like this Redken Scalp Relief Soothing Balance Shampoo! It's good for sensitive hair and skin! One of my favourites.